ARSENAL v NEWCASTLE UNITED. PIRATE BY ROSS. 20th SEPTEMBER 1948. SUPERB CONDITION, VERY NEAT T/C & SCORES INSERTED ON TEAM PAGE. DIVISION ONE. MANCHESTER UNITED v NEWCASTLE UNITED. 4th DECEMBER 1948. VERY GOOD CONDITION, NEAT SCORES INSERTED ON TEAM PAGE. DIVISION ONE. Wolverhampton Wanderers v Manchester United - League Division 1 - 28/09/1957 at The Molineux Grounds. Duncan Edwards in the Manchester United team. Tottenham Hotspurs V Manchester City 10/10/1960 Official Programme. Div 1, 21st Nov 1964. LEICESTER CITY v NEWCASTLE UNITED. 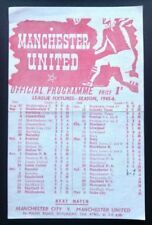 Official Programme 1st Division 13/11/1965 Leeds United v Arsenal. It is for the match played on 13th November 1965 between Leeds United and Arsenal. It is a bit discoloured in keeping with age, with a light crease on the front cover (see photo). Otherwise it's in fairly good condition considering it's age. League Div1. Luton Town v Manchester United. Programme has score wrirten in and is in a reasonable condition for its age Low start price. From a smoke free home. RARE & VINTAGE 25 OFF CLUB FOOTBALL PROGRAMMES 1950's International semi final. 68/69 Manchester City v Everton fa cup semi final. 68/69 WBA v leicester city. 58/59 walsall v lincoln rust from missing staples pen changes. 68/69 wolves v manchestet city. 61/62 shrewsbury v colchester. ARSENAL v MANCHESTER CITY 6/12/47. PLAYED @ ARSENAL STADIUM, HIGHBURY. LEAGUE DIVISION 1. League match 23 April 1960, faults/cond. Good condition, fold, r staple/staining, sml number written in corner, one neat team chg see photos. Aston Villa v Newcastle United. Poor Good Condition - Stain through all pages, folded, Dogging - See Pic's. Date of match 8 March 1961. New listingRARE & VINTAGE 30 OFF CLUB FOOTBALL PROGRAMMES 1950's onwards International . MANCHESTER CITY v NEWCASTLE UNITED. Arsenal v Newcastle United 25-10-1952 Division 1 football programme. slight centre fold and slight creasing otherwise good. IN GOOD CONDITION. ALL PROCEEDS FROM THE SALE OF THIS ITEM GO TO THE CHARLTON ATHLETIC MUSEUM, RUN BY VOLUNTEERS AND INDEPENDENT OF THE CLUB. Manchester United v Arsenal. Div 1, 5th Oct 1968. Newcastle United v Manchester United. Div 1, 8th Sept 1965. Football programme of the division 1 fixture Fulham v Leicester City on Saturday April 9th 1960. This is generally in good condition. However there is writing on the team page showing one player change and a change of referee and a slight horizontal central fold. Also there is slight discolouration due to age. Aston Villa v Manchester City, (Div 1), 25.11.1961. Some staple bleed evident otherwise a crease free programme in good condition. No tears or writing within, (See photos).